Profile: Josh returned to Marine for his third spell in mid-November 2015 from Cirencester Town for whom he joined from Hungerford Town just after the start of the 2014/15 season. He first signed for the club from Highworth Town in July 2012, following his former manager Dave Webb to the Webbswood Stadium. Josh then departed for his first spell Hungerford Town at the start of the 2013/14 season but by November 2013 he had returned to Marine and remained until the end of that season. At the conclusion of both seasons he helped us reach the Semi-Final of the playoffs in both the 2012/13 and 2013/14 seasons only to lose to Merthyr Town on both occasions. 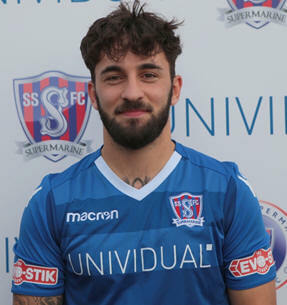 At the start of the 2014/15 season he re-joined Hungerford Town but just a month into the season he signed for Cirencester Town from where he has re-joined Swindon Supermarine for a third time in November 2015 and has been our leading goalscorer in the past two seasons and has scored over 100 goals for the club.